In thinking about data analysis, I realized that I don't have a clear idea of what analyses are possible, their advantages and shortcomings. So I'll just list them all, in two parts, single cell and ensemble techniques. As I continue reading, I will hopefully add more esoteric methods. The simplest of all analyses is the peri-stimulus time histogram (or for non-stimulated responses, peri-event time histogram). 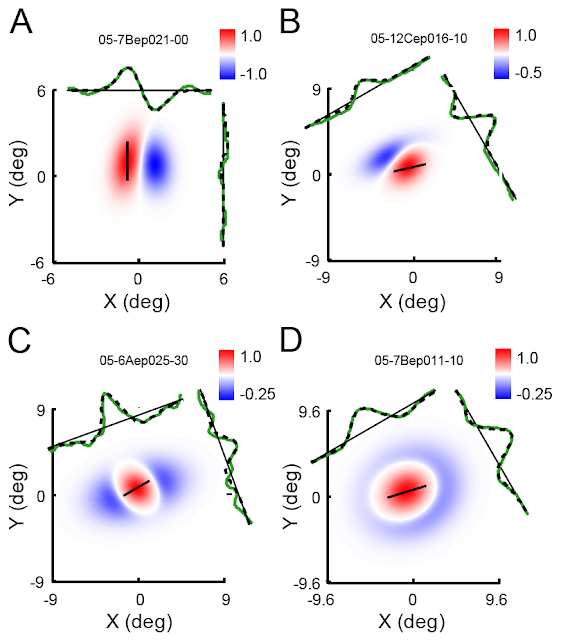 You record from a neuron while repeating a stimulus, and sum the spikes following a trigger into bins. Response of neurons in gustatory cortex to different tastants; the triggering event is a lick. From Katz et al, 2001. My review. PSTHs are quick, dirty, and reveal the obvious, but have significant limitations. First, PSTHs are highly sensitive to bin size. In the figure above, in each time bin, the neurons respond to different tastants. Bin size can drastically change how neurons are characterized: before Katz's paper, people guessed that only 10% of gustatory cortical neurons encoded taste; using 500ms time bins, Katz estimated 30-40% of neurons were taste sensitive. PSTHs also ignore the context surrounding an event. For example, simple PSTHs are inappropriate if stimuli are presented on an oscillating background, unless you otherwise compensate for oscillations. Furthermore, the identity of triggering events may not be obvious for rapidly changing stimuli. To look at those, reverse-correlation is a better technique. 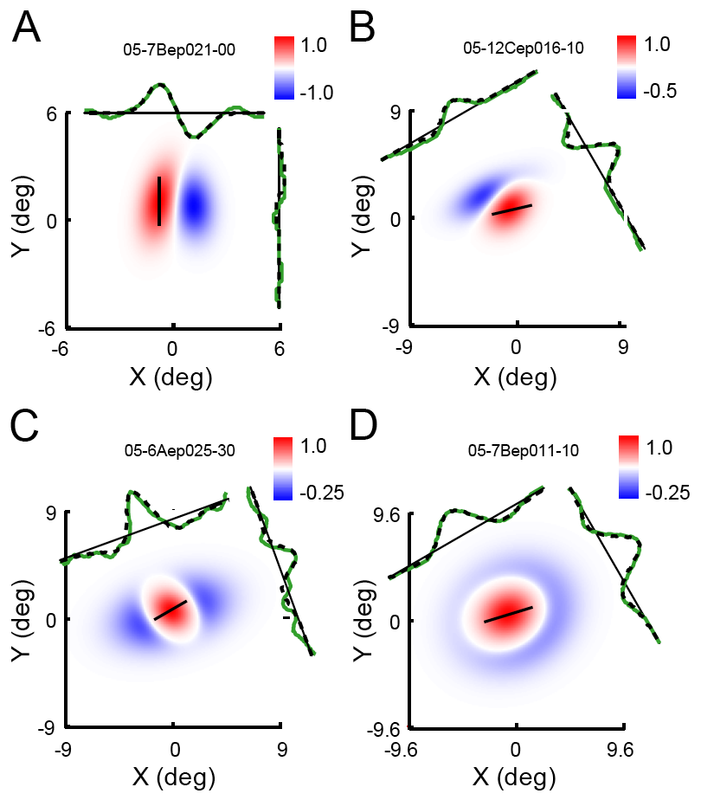 For neurons that function in an oscillating context, spike timing matters less than spike phase. The example below is a recording from the olfactory bulb following an odor presentation. In the PSTH on the left, there is an obvious tonic response to the odor. On the right is a phase plot, where the breathing cycle was transmuted from seconds into degrees, with inhalation at zero degrees. From the phase plot, you can see that the preferred spike phase changed over the course of the response. What is especially interesting are cells that maintain the same firing rate over moderate bin sizes (~300ms), but change their phase. Left: PSTH of OB neuron spiking following an odor. Right: Spike phase of this neuron. 0 degrees = start of inhalation (see breathing plot on left). The neuron's preferred phase of the breathing cycle changes between breathing cycles. From Bathelier et al 2008. Phase plots are obviously only useful in oscillating contexts, although these contexts can vary. In the hippocampus, Buzsaki has found that there is phase precession around the theta oscillations. In olfaction, the phase is usually defined around the breathing cycle. In gustation, it is the licking cycle. Once you have many PSTHs or phase diagrams for a neuron, the next step is to organize the PSTHs. In other words, you have to identify which stimuli cause the neuron to respond, given some definition of "response." The set of all stimuli that a neuron responds to are its "receptive field." The term "receptive field" comes from the visual system. Retinal or visual cortical neurons are excited by stimuli in one location, and inhibited by stimuli in other locations. You can similarly plot their orientation and direction selectivity. For the hippocampus, the receptive field is location. Receptive fields of V1 neurons. Excitatory regions shown in red, inhibitory in blue. You can see orientation selectivity in panels A-C.
From Tanaka and Ohzawa, 2009. For olfactory or gustatory neurons, the "receptive field" is simply the set of odorants or tastants that elicit responses (which unfortunately is harder to visualize than a nice center-surround). In the olfactory bulb, there is a lot of disagreement as to how sparse or dense mitral cells' receptive fields are, in part due to the semantics of a "response." In the anesthetized state, mitral cells respond with large firing rate changes, while in the awake animal, these are less pronounced. However, there do seem to remain phase changes in the awake state. In thinking about these analyses, I remembered the Lin and Katz paper where they used gas chromatograpy to deconstruct a natural odorant into its components. While this is not an analysis technique per se, I think it's important to consider how stimuli are combined in the brain. For example, do the component odorants in a natural odorant combine linearly or non-linearly? How do odorant receptor neurons and mitral cells respond to mixtures of odorants? While people have made stabs at answering these questions, the answer remains elusive. In the visual system, retinal and visual cortical neurons have been found to have highly non-linear receptive fields. A. Gas chromatography of cloves. B. Intrinsic imaging of OB during gas chromatography. The clove response (C), is more than just a sum of B. D&E. An artificial mixture of clove components elicits a map similar to the clove map. From Lin and Katz, 2006. As mentioned before, PSTHs are not good at detecting responses to rapidly changing stimuli. In the visual cortex, this has been addressed via reverse correlation techniques. Rather than look at the spike following an event, reverse correlation looks at which stimuli precede a spike. This is most useful in visual cortex, where it is possible to present movies, record neurons' responses, and then use reverse correlation to decode their spatiotemporal receptive field. That is, besides the spatial information of the receptive field, you also gain information on how the receptive field changes; for example, whether a certain area is both inhibitory and excitatory at different times. 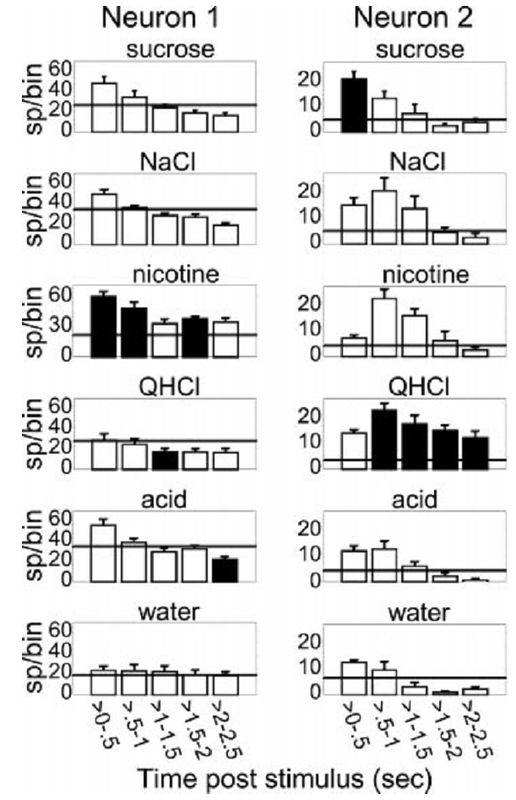 This technique is obviously less useful in olfaction and gustation, where stimuli vary less rapidly. And it is impossible to record natural stimuli for playback to an animal. Bathellier, B., Buhl, D. L., Accolla, R., and Carleton, A. (2008). 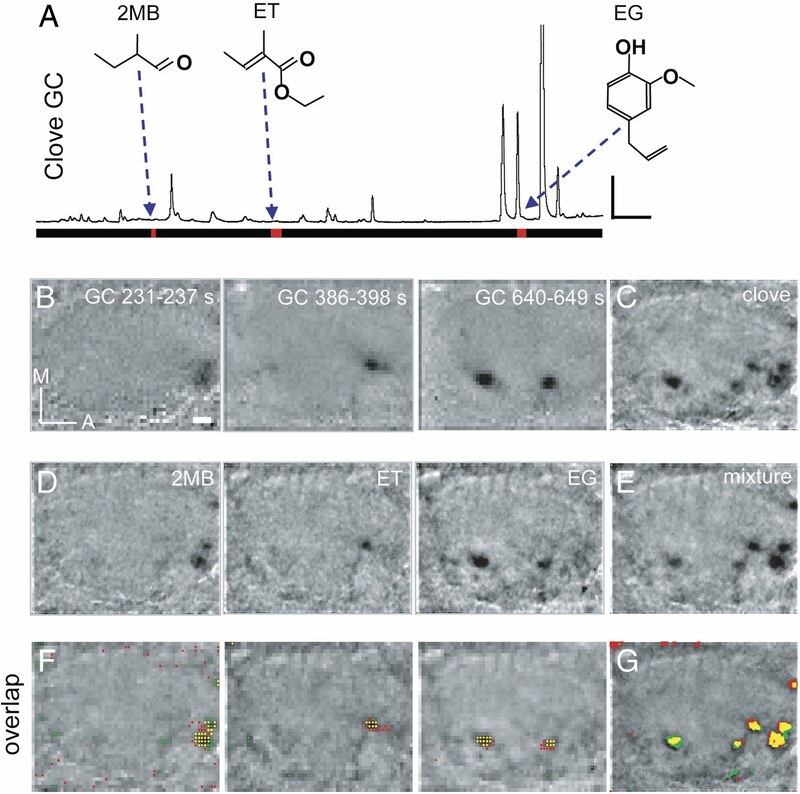 Dynamic ensemble odor coding in the mammalian olfactory bulb: sensory information at different timescales. Neuron 57, 586-98. Katz, D. B., Simon, S. A., and Nicolelis, M. A. L. (2001). Dynamic and multimodal responses of gustatory cortical neurons in awake rats. The Journal of neuroscience 21, 4478-89. Lin, D. Y., Shea, S. D., and Katz, L. C. (2006). Representation of natural stimuli in the rodent main olfactory bulb. Neuron 50, 937-49. Tanaka, H., and Ohzawa, I. (2009). Surround suppression of V1 neurons mediates orientation-based representation of high-order visual features. Journal of neurophysiology 101, 1444-62.